We got the call Friday afternoon, the day after Thanksgiving, from our neighbor across the street. Earlier that morning a hiker had passed through the park, saw Mike’s tent and hailed him. There was no answer. The policemen shook their heads. “Mike’s not talking to anyone now,” one said. The cause of death was uncertain. Evidently, Mike was diabetic. Obviously, he drank. Temperatures had plummeted to well below freezing the night before. Anyway you look at it, it was a tough way to go out. Thirty years ago Mike had run a small cobbler shop in town. Later he moved the business a few miles up the road. Eventually it went belly up; no one thought to have old shoes repaired any more. Mike and his girlfriend bought a house in the neighborhood, an old Victorian cottage. They drank too much. Over the years the house fell into disrepair and Mike’s girlfriend succumbed to the effects of alcoholism. The house was sold, and Mike disappeared. Now after 30 years he had returned. Father Tom is the local priest. My neighbor spoke to Father Tom and in the end it was Father Tom who called the police. They came to the park to talk with Mike. They made several attempts to get him hooked up with social services. In the end Mike wouldn’t budge. Heavy wet snow fell across the region yesterday afternoon and continued into the night; temperatures dropped below freezing. I awoke early and looked out the back window just as the heavy snow on the uppermost branches of the distant pines caught the morning sun. Suddenly I understood why after all these years Mike had come back, and now I knew why he would never leave. It was a grey day. Yesterday’s biting cold had lifted to a balmy morning temperature of 42 degrees. I took the dog out for a run over the grassy expanse at the mill down by the river. When we passed by the entrance gate, I let her off leash; and like a small white sheep she bounded through the remnants of dry leaves lying in the tall grass at the base of the ancient sycamore trees. The river was low and black and fast as it ran along the base of the concrete retaining wall at the back of the old mill. We paused to watch it pass around the bend where it would begin its descent into the gorge. I snapped the leash onto the dog’s collar and we crossed the main road at the stoplight and headed up Mountain Road to the blue-blazed trailhead. As the dog nestled her nose into the brown debris at the far edge of the tarmac, I noticed a man standing on the front porch of one of the small shanties perched along the street. He was a big mustachioed man with a shaved head. You could see tattoos on the biceps that bulged beneath the short sleeves of his T-shirt. He stood coiling a heavy-duty extension cord around a bent forearm. “That a Jack Russell?” he called out as we walked by. I paused and nodded. “I think they call it a Jack Russell rough cut,” I said. “They’ve certainly got a lot of energy,” I said. I stood in silence, aware of a slight tug on the leash in my hand. “But I figured, hey, she had a good life. Fourteen years, that’s a good long life for a little dog,” he said. “And you have yourself a nice Thanksgiving,” I said. Up ahead we picked up the trail. A little way into the forest I let the dog off leash again and watched her bound through the bed of dry brown leaves. Lines intersect, triangles form; a flat plane becomes three-dimensional space, and morphs into space-time, which, if theoretical physicists are correct, folds in on itself, and the past connects with the present in this moment. I first heard the name of Henry Ossawa Tanner in an NPR interview with Bill and Camille Cosby when they discussed loaning 62 pieces from their extensive collection of fine art to the Smithsonian Institute. Henry Ossawa Tanner was an African-American artist who attended the Pennsylvania Academy of Fine Arts in 1879, where he studied under Thomas Eakins. Tanner would later emigrate to France; there he discovered a society where the issue of race mattered little. It was during a return visit to the states that Tanner painted the piece for which he is perhaps best known, The Banjo Lesson. 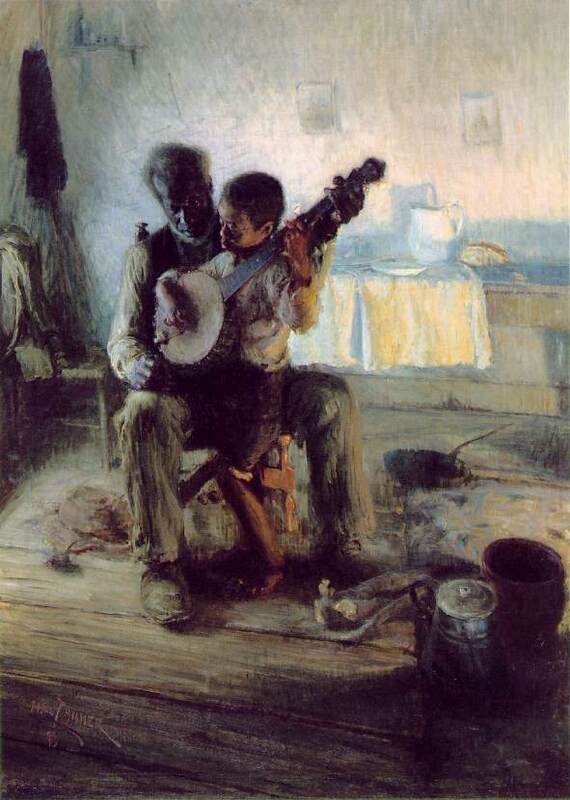 In this rendition a white-bearded black man sits on a chair, cradling a young black boy and a banjo in his lap. The older man supports the instrument as the young boy fingers the frets and plucks the strings: a moment of mentoring, captured in time. The pair is enveloped in light: a soft blue-white glow from the left, a warm brighter illumination from the right. The boy and the old man seem to be caught up together in this interactive moment. What they share is something more than a mere instrumental lesson. Tanner’s portrait brought to mind a long-ago summer afternoon when I sat on the front porch of our house, reading a book to my granddaughter. Someone snapped a photograph of the two of us. Like Tanner’s portrait of an adult and a child, this photograph captures something more than the mere reading of a children’s book. I think back to my early days of clinical practice, when I first learned the ropes: how to interact with a patient in the privacy of the exam room. As part of my post-graduate training I worked at an inner city clinic in the north end of Hartford. One day a boy’s name appeared on my schedule, a young Jamaican boy, recently discharged from the hospital with a concussion sustained when he was struck by a car while riding his bicycle. The discharge summary stated that he still exhibited some soft neurological signs. During this and a string of follow-up visits, it became apparent to me that something more was going on; this boy was clinically depressed. I subsequently learned that he had been culturally displaced from his grandmother’s home in rural Jamaica when he was sent to live with his mother in an urban New England setting. During our visits the boy spoke little, but little by little I learned about his former life: how he would feed the chickens in the yard outside his grandmother’s home, the plantain trees in the yard, a lazy cat resting on the porch in the noonday sun—and the day his dog died a traumatic death at the hand of a neighborhood bully. Much of this history I gleaned from pictures that the boy drew for me: simple pencil sketches of the house, the trees, the yard and the dog. During office visits we would look at the pictures together, and the boy would talk about what he had drawn. Little by little I learned about his life, little by little he opened up, and little by little his depression lifted. Those were the days before the advent of SSRIs, those magical pharmaceutical substances that allow outpatient office visits to be compressed into a mere 9 minutes of time; those were the days when I had the luxury to sit with a patient and give them the time they needed—and the time I needed—to gather the data necessary for an adequate clinical assessment, to give them time to heal. An article cited in Becker’s Hospital Review indicates that in a recent survey 65% of clinicians voiced disillusionment with clinical practice, largely because they no longer felt they had the time to listen to their patients. In short, they had lost the opportunities for those mentoring moments, when clinician and patient step outside of time into a different dimension, a place where the two of them are bathed in light—perhaps a soft blue-white glow from the left, a warm, brighter illumination from the right. [I]t is far more glorious to carve and paint the very atmosphere and medium through which we look, which morally we can do….Every man is tasked to make his life, even in its details, worthy of contemplation of his most elevated and critical hour. On my morning dog walk I encounter a neighbor ambling down the sidewalk, her feet sweeping through the crisp vermilion carpet of fallen leaves. My thoughts run to the story I heard on the radio about the latest study on Alzheimer’s patients. It seems that they carry their feelings with them long after the memories which created those feelings have faded away. Sad feelings persist during a slow decline into depression; happy or pleasant feelings carry the day. Perhaps my neighbor is on to something; perhaps we should all work on cultivating pleasant feelings by focusing on our positive experiences. A solitary crimson leaf, dancing in the night, suspended by a single silken thread. The image burns in my brain. I recall the recent death of a young woman, her dark body suspended from a single cord. Two mental images: one delightful, one horrific. Objects do not house emotion; we bring our emotions to them. In them we see goodness or ugliness, horror or delight; and these are the emotions that linger long after the memory of the thing has faded from our consciousness. What tragic farce is this? Our lives have run aground here.